Lit. three great Buddhas. The three largest images in the history of Buddhist statuary in Japan. 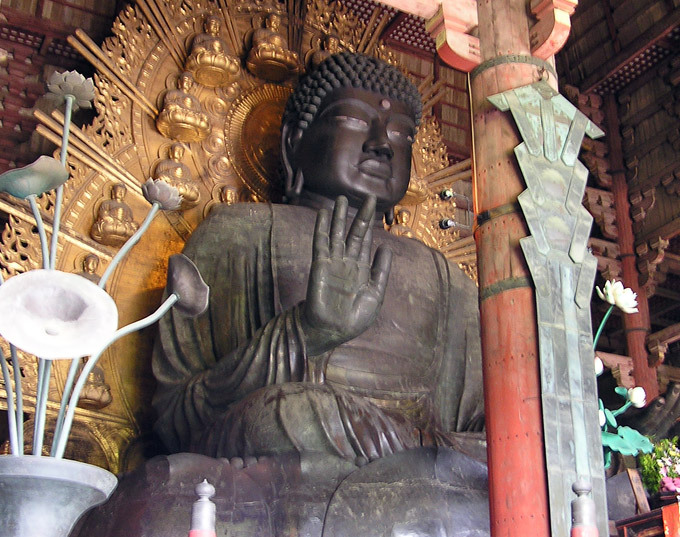 Originally the sandaibutsu were said to be the Great Buddha in Toudaiji 東大寺, Nara; the Buddha in Taiheiji 太平寺, Osaka; and the Buddha in Sekidera 関寺, Shiga prefecture. In later centuries, after the latter two statues were lost, this designation changed and the Buddhas of Toudaiji, Koutokuin 高徳院 in Kamakura (Kanagawa prefecture), and the Asuka Buddha in Angoin 安居院 (formerly part of Houkouji 法興寺) Nara, were referred to as the sandaibutsu. The Great Buddha of Nara Nara Daibutsu 奈良大仏 was consecrated in the year 752. It is a seated bronze figure 14.73 m high representing Vairocana Buddha *Rushanabutsu 盧遮那仏, and although it has been damaged by fire on numerous occasions the original figure is still preserved in Toudaiji. The Great Buddha of Taiheiji, was a standing figure of the *Kannon 観音 18m high. This figure was said to have inspired the building of the Nara Daibutsu, but it was very seriously damaged in 1086. The seated figure of *Miroku 弥勒 in Sekidera, was destroyed in an earthquake in 976. It was restored by the sculptor Koushou 康尚, and the new statue in wood and lacquer, completed in 1018, measured 7.5 m in height. This in turn was destroyed in fire caused by war in the period 1596-1615. The Asuka Daibutsu 飛鳥大仏 is a bronze statue 2.75m high, thought to represent *Shaka 釈迦. It is the oldest surviving Buddhist statue in Japan today, estimated to have been completed in the year 609. Temple legend says that the sculptor was the famous Kuratsukuri no Tori 鞍作止利. The statue sits on a stone pedestal in the cross legged posture known as *kekkafuza 結跏趺坐. 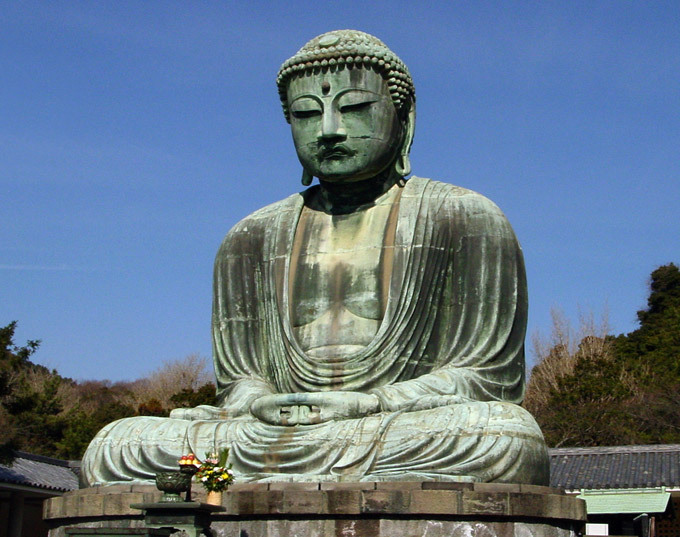 The Kamakura Daibutsu 鎌倉大仏 is a cast bronze seated figure representing *Amida 阿弥陀. It was made in the mid-Kamakura period; some records suggest that casting may have begun in 1252. The statue is 11.5m high, and combines stylistic influences from Southern Sung China in the face and body with Unkei 運慶 (?-1223) style draperies.